WeCare Medical Transportation is a locally owned business established in 2010. 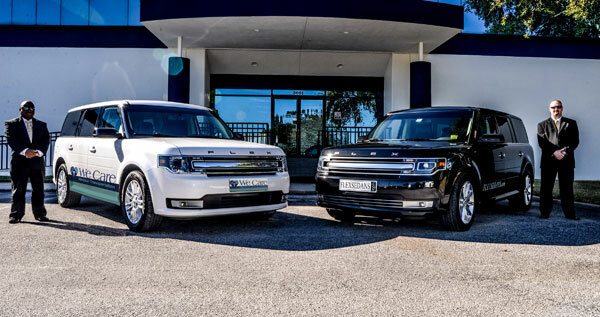 We own a fleet of impeccably new Ford Flex low profile sedans with leather interior that are cleaned daily. Our Chauffeurs are professionally trained, CPR certified and extensively background checked. Unlike taxis, we are a private “member only” service so our staff and vehicles are dedicated to you and your patients. Our members are primarily Doctor’s Offices, specialty practices, healthcare facilities and senior communities. Members pre-purchase hours of service which are broken down in to four 15 minute trip segments. As trips are ordered and performed, time is deducted from hours purchased- Simple, Easy and a great value. Wecare also works closely with hospitals, insurance providers, long-term care facilities, health care providers and health care networks to determine how to best serve our clients in need of non-emergency medical transportation. When you are a WeCare Transportation Member you can reserve a sedan to transport passengers you designate to and from critical appointments. WeCare focuses on ensuring that the patient receives high-quality service at the most efficient price. We provide non-emergency transportation for medical appointments, rehab centers, and other medical facilities in the Tampabay area, we show up on time every time or the service is absolutely FREE! Unlike other providers, WeCare requires only a two hour advance notice for our sedan service and only four hour notice for wheelchair SUV or Van service.